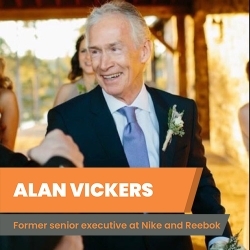 Miami, FL, September 04, 2018 --(PR.com)-- SportsEdTV has appointed Alan Vickers, former senior executive at Nike, Reebok and Starbucks, as Vice-Chairman. With this appointment, Vickers joins the experienced management team guiding the development of this Miami-based online sports instruction media company, which launched in August. “The appointment of Alan strengthens our already deep management bench,” said Chairman and CMO Robert Mazzucchelli, “and gives us an insiders perspective on how the sports industry’s major players view global new media and direct-to-consumer sales and marketing technologies.” In his new role with SportsEdTV, Vickers will focus on business development, as well as building relationships with sponsors and partners, including global sports organizations and major brands within the sporting goods industry. Vickers has enjoyed a long and successful career on the retail, manufacturing and marketing side of the sports business. He managed the UK’s leading sporting goods retailer, Olympus Sport, from 1979 to 1992. He then joined Nike, where he held senior sales and marketing roles (including President, Nike France and Director of Sports Marketing for the European region). From 1998 to 2002, Vickers worked with Olympic Games marketing partner, International Licensing & Marketing. From 2002 to 2004, he was General Manager of Reebok. Rounding off his extensive brand experience he was EVP Global Sales and Operations at California-based action sports leader Quiksilver. Most recently, he has been a board member and has invested in technology and fitness related early stage companies. About SportsEdTV: SportsEdTV.com provides free, world-class, online video instruction in over thirty sports. Our expert coaches teach technique, strategy, tactics, strength and conditioning, nutrition, mental toughness, and the unique lifestyle complexities of being an athlete to competitors and sport participants at all levels, from beginner through professional. Everyone can improve by watching our videos. Our “tips of the day” and video analysis of great champions are insightful, and viewers can enjoy our fun “play of the day” features and global news updates on their favorite sports, teams and events. It’s great for athletes, coaches and parents looking for an edge.